Efforts to reach a collective agreement for the country’s mail carriers continue Wednesday as officials from Canada Post and the Canadian Postal Workers Union meet with an arbitrator. Elizabeth MacPherson was appointed the arbitrator after the federal government forced the mail carriers back to work on November 27 following weeks of rotating strikes. CUPW filed a constitutional challenge against the legislation with the Ontario Superior Court last month arguing the Supreme Court of Canada has already declared the right to strike protected. However, it will participate in arbitration on a “without prejudice basis” subject to its challenge and any court rulings. Ahead of that legislation, MacPherson served as the mediator in seven days of talks that failed to reach an agreement. Discussion Wednesday will determine what issues between the sides are still in dispute. A release from the union said that would be up to the arbitrator. Canada Post offered a wage increase in its final offer to the union on November 15, but CUPW National President, Mike Palecek said it did not address major issues, such as equality between rural and urban carriers, creating more full-time jobs, and health and safety. 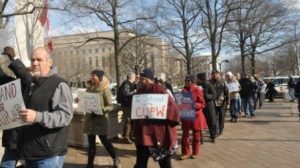 The union has said the corporation faces a serious injury crisis with an injury rate of 5.4 times higher than the average federal worker. Following the protest, APWU President, Mark Dimondstein and the union’s political director attempted to speak with Canadian Ambassador, David MacNaughton but were turned away. Instead, the APWU and NALC will send him a letter demanding the Trudeau government bargain in good faith with CUPW.